Are you currently an investment property owner or thinking of becoming one? Are you concerned with the time and work involved in managing a rental property? We can help ease many of your concerns by doing a lot of the heavy lifting for you, so that you can maximize the return on your investment and minimize the stress and complexities of managing a residential or commercial investment property. Primecorp Property Management is an established and professional property management company operating in the Ottawa and Gatineau area. Our portfolio is comprised of residential high-rises, walk-ups, townhomes, and commercial properties. The Primecorp Property Management Team is led by Jennifer Davies, who is considered a market expert in property management, and is the primary liaison between staff, contractors, and tenants. As a Senior Property Manager, Jennifer has in-depth knowledge of Ontario's Residential Tenancies Act, and has a great deal of experience creating elegant solutions for complex challenges, always aiming to ensure the best possible outcome for all parties. Jennifer believes that taking excellent care of our tenants is the best way to represent the interests of property owners and real estate investors. 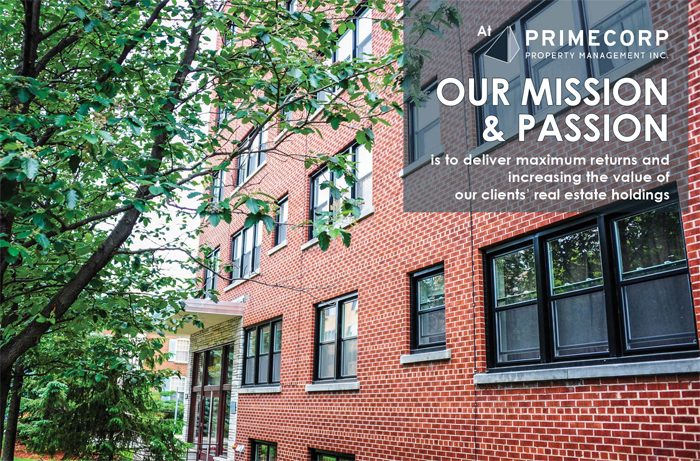 At Primecorp, our focus is on service excellence in all aspects of residential and commercial property management. We work hard to ensure that all our residents and tenants are very happy with their accommodations. What Property Management Services Does Primecorp Provide? Primecorp will leverage the incredible power of the web through our website and various online marketing channels as well as traditional media outlets as required to fill any vacancies as quickly as possible. Primecorp will process all rental applications to ensure that only tenants who meet Owner-approved qualifications will be considered and approved as tenants. We aim to avoid turnover in our units, by attracting tenants who will respect their rental units and their neighbours and will uphold the obligations specified in their lease. Primecorp will answer all leasing inquiries in a timely fashion, to the extent that our internal resources allow at any given time. Primecorp will ensure and enforce all stipulations outlined in any leasing agreements associated with specific rental units. Primecorp collects all rents and payments due, additional rent and any other amounts payable by Tenants so that they are regularly received at the earliest possible date, by Primecorp, in accordance with the terms of the respective Tenants' Leases. evict Tenants and recover possession of the premises; and settle, compromise, discontinue and release claims or reinstate tenancies. Primecorp will keep proper books and records in accordance with generally accepted accounting principles. a report apprising as to any damage to the Real Property and the repair and replacement thereof, and as to any anticipated or required change or alteration or improvements to the equipment or systems, in each case comprising part of the Real Property. Primecorp shall have available the books and records it maintains in relation to the Real Property. Primecorp shall assist in the conduct of any spot or internal or external audit (including Owner audit, operational cost audit and ad hoc audit) that Owner performs, requests to be performed from time to time or otherwise authorizes. Primecorp shall carry out, at reasonable intervals, physical inspections of the Real Property including inspections of the roof, foundation, walls, sewer, water, electrical, structural, plumbing, mechanical, ventilation and air conditioning systems and recommend to the Owner preventative maintenance procedures to preserve the long-term viability of the Real Property. Primecorp will operate, manage and maintain the Real Property in a competent, faithful, economic, and efficient manner as would a prudent and reasonable owner of a similar property in the geographic area. Please inquire about further pricing details regarding your specific property management requirements. Primecorp can also provide additional services, related to a given property, to be negotiated upon sign-up. Have you ever had a tenant not pay rent, but remain in a unit for longer than 60 days? Have you ever had a vacancy for greater than one month? Have you ever been on vacation or unavailable when an emergency occurred at your property? Have you ever asked family or friends to help you with your property in some form in the last year? Do your tenants frequently call you regarding their rental unit? Have you enlisted the help of more than one contractor in the last year? If you answered, "YES" to one or more of these questions, you would likely benefit from the professional property management services and assistance that Primecorp provides. Contact us today, so we can create a plan to maximize the full potential of your rental property, while significantly reducing many of the hassles and responsibilities associated with being a landlord… we'd love to hear from you!